September 28 is the 271st day of the year(272nd in leap years) in the Gregorian calendar. 94 days remain until the end of the year. 1893 – Foundation of the Portuguese football club FC Porto . The year 551 BC was a year of the pre-Julian Roman calendar. In the Roman Empire, it was known as year 203 Ab urbe condita. The denomination 551 BC for this year has been used since the early medieval period, when the Anno Domini calendar era became the prevalent method in Europe for naming years. Year 782 (DCCLXXXII) was a common year starting on Tuesday of the Julian calendar. The denomination 782 for this year has been used since the early medieval period, when the Anno Domini calendar era became the prevalent method in Europe for naming years. Leoba was an Anglo-Saxon nun who was part of Boniface's mission to the Germans, and a saint. Saint Exuperius was Bishop of Toulouse at the beginning of the 5th century. Saint Faustus of Riez was an early Bishop of Riez (Rhegium) in Southern Gaul (Provence), the best known and most distinguished defender of Semipelagianism. John of Dukla is a saint in the Roman Catholic Church. He is one of the patron saints of Poland and Lithuania. Aaron of Auxerre was a bishop of Auxerre. He has been beatified by the Roman Catholic Church, and his relics are venerated in the Church of Saint-Germain in Auxerre, where his feast day is celebrated on 28 September. Saint Annemund, also known as Annemundus, Aunemundus, Ennemond and Chamond, was an archbishop of Lyon. Annemund was a councillor of Clovis II and a friend of Wilfrid of York. The year of his death is variously given as either 657 or 658. Saint Eustochium. 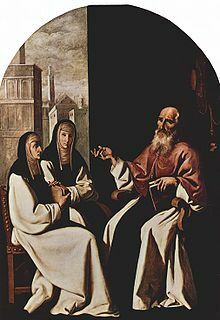 Born Eustochium Julia at Rome, she was the daughter of Paula and is also venerated as a saint and was an early Desert Mother. She was the third of four daughters of the Roman Senator Toxotius, for whom Jerome made a lot of fanciful claims of ancestry. After the death of her husband around 380 Paula and her daughter Eustochium lived in Rome as austere a life as the fathers of the desert. Eustochium had three sisters, Blaesilla, Paulina, and Rufina, and a brother, Toxotius. ↑ "ILLUMINATO Filippo". President of the Republic of Italy (in Italian). Retrieved 19 April 2019. Wikimedia Commons has media related to September 28 .